I had the opportunity to play with Amy & Rachel a couple times during ECMW 2014. Once at their Breakout Stage showcase and then again at the Music PEI stage. A true pleasure. 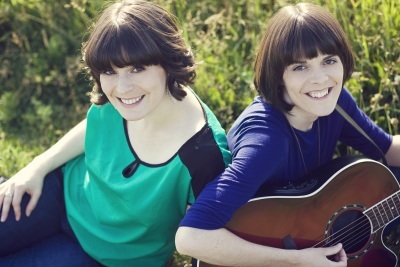 PEI’s singing, song-writing sisters have been making music together as long as they can remember. This folk/pop duo oozes sincerity and warmth. During live performances, their easy banter and relatable songs draw you in – before you know it, you feel like part of the family. 2013 has been an exciting year for Amy & Rachel: in February, they were named national finalists in CBC Music’s Searchlight Competition; in June, the girls were thrilled to sing harmony for Serena Ryder during her performance at PEI’s Big Red Music Festival; and on October 1st, 2013, they released their long-awaited Self-titled, Debut EP. Recorded at multi award-winning Lakewind Sound Studios in NS and co-produced with Mike Shepherd, this album is the perfect showcase for Amy & Rachel’s “fresh, original and very likable sound and their delicious harmonies” (David Durant, Under The Radar Live Sessions on Brooklands Radio, UK). Top to bottom, it resonates.